Your bathroom is more dangerous than you think. No, this isn’t the setup for a joke: Every year, thousands of people are killed or injured in preventable accidents that take place in their bathroom. 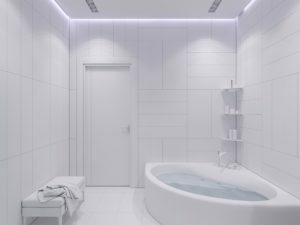 Once you think about it, it’s not that surprising so many accidents happen in the bathroom, given the combination of water, hard surfaces, and electrical appliances in one small room. Let’s take a look at some of the most pressing bathroom hazards. It shouldn’t surprise anyone to hear that a lot of water flows through the average bathroom. Between the sink, the toilet, and the bath/shower, most bathrooms consume several gallons of water every day. When even a little bit of that water ends up on the floor, it can present a serious danger that shouldn’t be taken lightly. The most likely source of water on the bathroom floor is from the shower; make sure that you are using either dual curtains (with the inner curtain sitting inside the tub and the outer curtain on the outside), or, even better, a glass shower door, to prevent leakage. Many people try to save money by putting a space heater in the bathroom. While the impulse is understandable, the dangers to which it exposes you are enough that you might want to reconsider. The first of these dangers is the one that results from placing any sort of electronics in a water-heavy environment (remember the water on the floor we mentioned above?). Secondly, an ill-timed slip on a slick bathroom floor can result in falling on the space heater and getting burned. If a towel or piece of toilet paper gets too close to a space heater, it could result in a fire. If you must have a space heater in your bathroom, consider its placement very, very carefully. What happens when bright lights hit shiny (and wet) white surfaces? You get a glare that can temporarily blind someone, causing them to stumble and even fall. Whether it’s a white countertop or a white floor, hard material that reflects a lot of light is a safety hazard in any bathroom. Towel racks have their purposes, but they are not meant to support the weight of a human being climbing out of a tub. 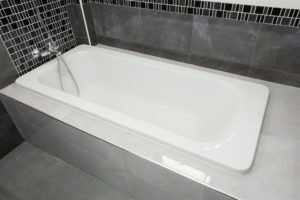 If someone in your household has trouble getting out of the bath, install a handlebar in the tub; using the towel rack is likely to cause a potentially dangerous slip and fall accident. Need safety equipment for your tub shower enclosure? American Bath Enterprises, Inc. carries the best in bath and shower supplies, including safety equipment for people with disabilities. For more information, call us today at 888-228-4925.